Inspiration flows between visual arts and music. Whether through an auditory experience of a musical performance or a visual encounter with a painting or sculpture, personal reactions to artistic expressions of others often move artists and musicians to create their own interpretations of what they see, hear, or feel. The Treasure Coast Youth Symphony’s spring program focuses on major orchestral compositions directly inspired by individual artworks or art forms. The impressionistic style of small but visible art strokes, sometimes dots, to create changes in light in texture becomes audible in Debussy’s Fetes from The Three Nocturnes. Three Botticelli paintings in the Uffizi Gallery in Florence were effectively described by Respighi in his chamber orchestra composition, Trittico Botticelliano. Mussorgsky’s Pictures At An Exhibition, originally scored for piano, was a tribute to the artwork of his dear friend, Viktor Hartmann and was later arranged by Maurice Ravel into an epic rendition for large orchestra. The evening’s concert also includes the Haydn Cell0 Concerto featuring soloist, Erick Lora, our 2017 TCYS Concerto Competition Winner. 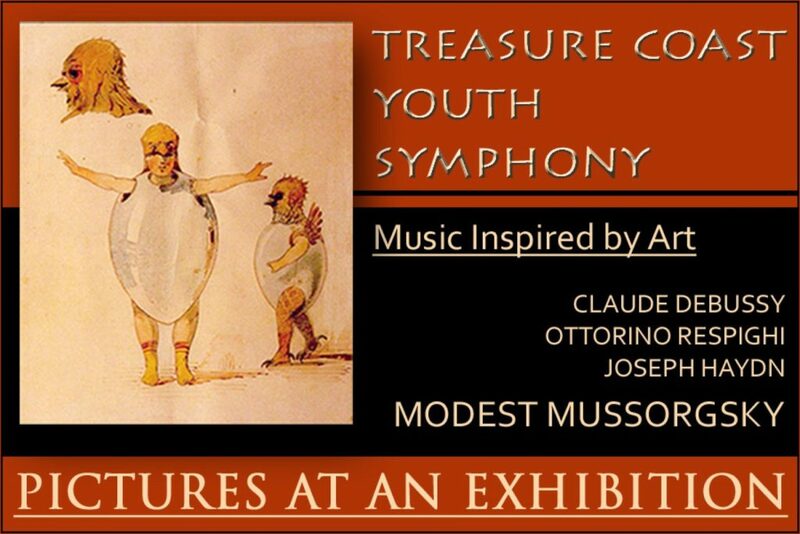 The musicians of the Treasure Coast Youth Symphony invite you to join them for this performance paying homage to these great artists whose classic works persistently tender emotional and intellectual inspiration to their audiences. Come, and be inspired!